Prize winners: Nevin Smith, Declan Ferris, Paul Graham, Christine Wilson, David Grattan, James Adair, and Raymond Clifford. 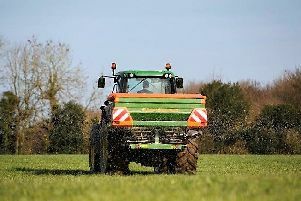 In spite of March 2019 being the wettest since records began, a week of sunshine and a warm breeze produced ideal ground conditions for ploughing, held at Moneycarrie Road, Garvagh on the lands of Sammy and Marie Wilson. The club welcomed a large crowd of competitors confirming the high level of interest in this sport at the present time. The event, which was held to support local medical charities, enjoyed a good level of spectator interest. Local farmer and ploughing enthusiast Mr William Clyde clearly enjoyed his day out and took time to elude the technical issues involved in presenting a well ploughed plot of land. 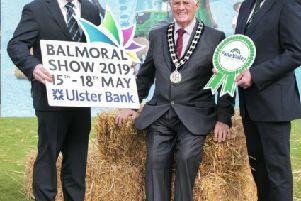 Judging for the awards was carried out by Desmond Wright MBE, Sam Bowman and Martin Stewart, each of them being full of praise for the high standard of ploughing on the day. Club Chairman Nevin Smith thanked the Wilson family for providing an excellent ploughing site, also Stephen Clyde and Son Agri Contracts for their help in preparing the land for ploughing. Thanks also to Iris and Derek Knight for providing Irish stew for the event. Novice Class (TBF Thompson Cup): 1st, Paul Graham; 2nd, Joel McKee; 3rd, Seamus Maguire. Ferguson Class (T Campbell Cup): 1st, Raymond Clifford; 2nd, Thomas Stewart; 3rd, Robert Acheson. Open Class (Andy Barr Cup): 1st, James Adair; 2nd, David Grattan; 3rd, Frankie Davidson. Horse Class (McClarty Cup): 1st, Declan Ferris; 2nd, Amy Young.